From the Start screen, swipe up (starting from the middle of the screen) to display the Apps screen. To navigate to the Start screen, swipe left from the right edge of the screen (to display the charms menu) then tap Start. 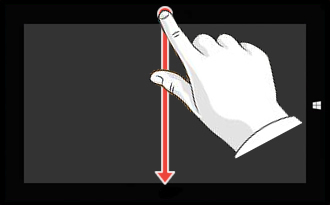 If using a mouse, move the pointer to the upper or lower-right corner of the screen then move up/down and click Start. From the Apps screen, tap an app. While using an app, swipe up from the bottom edge of the screen to view commands specific to the app. If using a mouse, click the right button on the mouse to view other commands. From any screen, swipe right from the left edge of the screen to switch between open apps. 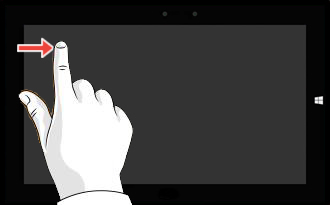 If using a mouse, move the pointer to the upper-left corner of the Start screen and wait until a thumbnail of an app appears. Move the pointer down the edge of the screen to open up the list of open apps and click on the desired app. To close an app, swipe down from the top edge of the screen to the bottom. 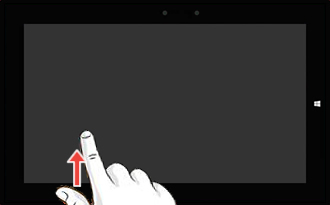 If using a mouse, move the pointer to the upper-right corner of the Start screen then click the X that appears in the corner. While using an app, swipe down from the top edge of the screen then, prior to lifting your finger, swipe left or right to snap the app to the desired location. 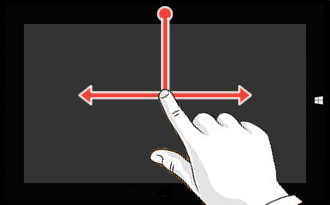 If using a mouse, move the pointer from the top of the screen to the middle of the screen then move the cursor left or right to snap the app to the desired position. Tap or click the empty pane then select any app from the Start or Apps screen. Swipe right from the left edge of the screen then, prior to lifting your finger, drag the app (the last app used) to the empty pane and release. Swipe right from the left edge of the screen then, prior to lifting your finger, swipe left to display the recently used apps menu. Tap and hold the desired app then drag to the empty pane and release. Once the two apps are side by side, the size of the panes can be adjusted by selecting and holding the divider then dragging left or right to the desired size.